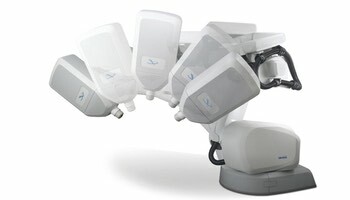 Cyberknife System is a unique radiation treatment delivery system using unique robotic mobility and continuous image guidance for delivering radiation with sub-millimeter precision. Our Cyberknife system was installed in 20XX. 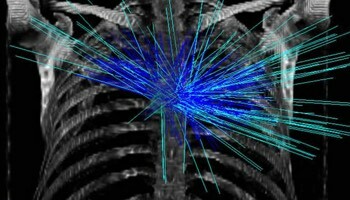 The robotic arm can delivery beams from thousands of different angles providing excellent tumor coverage, tight dose conformality, and steep dose gradients to achieve high radiation dose deposition to the target while minimizing adjacent tissue side effects. Additionally, the system provides continuous image guidance to eliminate the need for breath holding techniques and restrictive head frames to improve greater patient comfort. 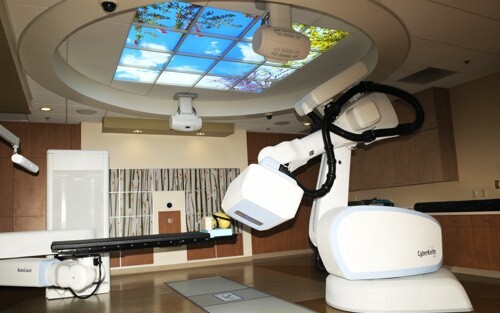 Thousands of radiation beamlets are directed to the target using the unique robotic arm of the Cyberknife system. Cyberknife system delivers higher doses of radiation in fewer treatment fractions. Proprietary X-ray imaging technology provides continuous imaging date for the Cyberknife system to track its target in real-time.